Daniel wrote about a “king of the South” who would play a pivotal role through history and just before Christ’s return. Who is the king of the South? Who was this king? Who will he be in the “time of the end” spoken of in verse 40? To answer these questions, we need a little background information. One of the first considerations is the setting of this prophecy. Daniel received the message in “the third year of Cyrus king of Persia,” which was 537 or 536 B.C. according to The Expositor’s Bible Commentary (Daniel 10:1). The prophecy of Daniel 11 begins with verses 2-4, which describe what would happen in the Persian and Greek Empires after Daniel was given this vision, and continues through “the time of the end” (verse 40). To understand the identity of the “king of the South,” we have to understand the directional designation—“South”—given to this king. The question is, south of what? The meaning becomes clear when we realize why this prophecy was given to Daniel. The angel that appeared to the prophet told him, “Now I have come to make you understand what will happen to your people in the latter days, for the vision refers to many days yet to come” (Daniel 10:14, emphasis added throughout). While some of Daniel 11 can be hard to understand, the use of a good Bible commentary, such as The Expositor’s Bible Commentary, can help one see how history has unfolded just as this prophecy had predicted. Now let’s consider who the “king of the South” was in Daniel 11:5. As we have already noted, verses 2-4 predicted historical events that came to pass in the Persian and Greek Empires. Specifically, verse 4 describes the division of the Greek Empire into four centers of power following the death of Alexander the Great in 323 B.C. One of the four divisions of Alexander’s empire was located in Egypt, which was south of Jerusalem. The leader of this kingdom is the “king of the South” spoken of in verse 5. In history, the rulers of this kingdom based in Egypt were called the Ptolemies. The division of Alexander’s empire that was to the north of Jerusalem was Syria, whose kings were called the Seleucids. The Seleucid leader was called the “king of the North” in verse 6. And why would events pertaining to the Ptolemies and Seleucids be of any significance? Undoubtedly, because the Jews residing in Jerusalem would be affected by the actions of these two great powers—one to the south and the other to the north. Jerusalem was invaded many times when these kingdoms clashed and was impacted by their actions. Daniel 11:5-31 documents interaction between the Ptolemies (the “king of the South”) and the Seleucids (the “king of the North”). The prophecy of Daniel 11 then pauses for some 2,000 years between the time of the Maccabees and the appearance once again of the “king of the South” at “the time of the end” (verse 40). 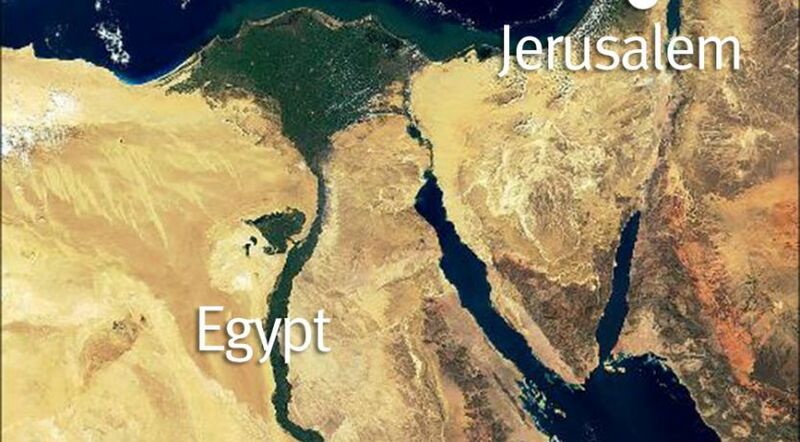 During this pause in the prophecy, a Jewish nation no longer existed in the Middle East. With the establishment of a Jewish nation (called the State of Israel) in the Middle East in 1948, interactions between a “king of the South” and a “king of the North” have once again become relevant for the Jewish people. But what nation or group of nations will fulfill the role of “king of the South” in the end time? The history of the Middle East provides a likely candidate, and the story begins with the patriarch Abraham. Ishmael, the son of Abraham by his wife Sarah’s handmaid, Hagar, is the father of the Arabs. Even though the birthright blessing went to Isaac as the son of both Abraham and Sarah, Ishmael would beget “twelve princes” and develop into “a great nation” (Genesis 17:20). Later, these 12 princes of Ishmael became heads of nations (Genesis 25:16). As the number of Ishmael’s descendants began to grow, Esau, the brother of Jacob (who was renamed Israel in Genesis 32:28 and, thus, is the father of the Israelites), aligned himself and his descendants with Ishmael by marrying one of Ishmael’s daughters (Genesis 28:9). What Ishmael and Esau had in common was that, even though they were firstborn sons, neither had received the birthright blessing, which was customarily given to the firstborn son. By God’s choosing (Malachi 1:2; Romans 9:13), the majority of the family’s possessions that originated with Abraham had been passed along to Jacob and his 12 sons, who were the heads of the 12 tribes of Israel. During the approximately 2,000-year pause in the prophecy of Daniel 11, from the time of the Maccabees to the establishment of the State of Israel, the Arab peoples adopted a new religion. A man named Muhammad reportedly began receiving multiple visions from Allah. These revelations were recorded in a book called the Koran. In time, Muhammad was recognized as a prophet, and the religion he founded was called Islam. Muslims, those who surrender to this teaching of Allah, worship on Friday and have their own calendar, which is about 11 days shorter than the calendar used in the Western world. Having their own religion has given the Arab peoples a basis for unity. Today the Organization of Islamic Cooperation includes 57 countries and approximately 1.6 billion people, located from Africa through Indonesia, as well as the Middle East. Even though the Ummah—the Muslim world—has a common religion advocating unity among and defense of fellow Muslims, several schools or branches of belief exist. While most Muslims are peaceful and peace-seeking, a radical element exists with the goal of dominating the earth, especially the Middle East, and forcibly installing Islam as the universal religion. Radical Muslims embrace terrorism as a means to their desired end. As we come to “the time of the end” spoken of in Daniel 11:40, something is apparently going to bring the Arab world together as a “confederacy” against Israel (Psalm 83:4-5) or allow a powerful Arab nation to emerge in order to fulfill the prophecy that the “king of the South” will fight against “the king of the North.” Perhaps this clash between the two powers will occur over the treatment of Muslims. Perhaps it will be a clash over oil or some economic disagreement. While the Bible doesn’t give us the reason or reasons for the fighting or provide the specific identity of this “king of the South,” the ancient nations of Edom, Moab and Egypt are all mentioned in the prophecy (Daniel 11:41). Edom and Moab will escape the retaliation by the “king of the North,” while Egypt will not. It thus seems likely that a leader from Egypt may become the “king of the South” or that Egypt will be part of the group of nations representing this power.